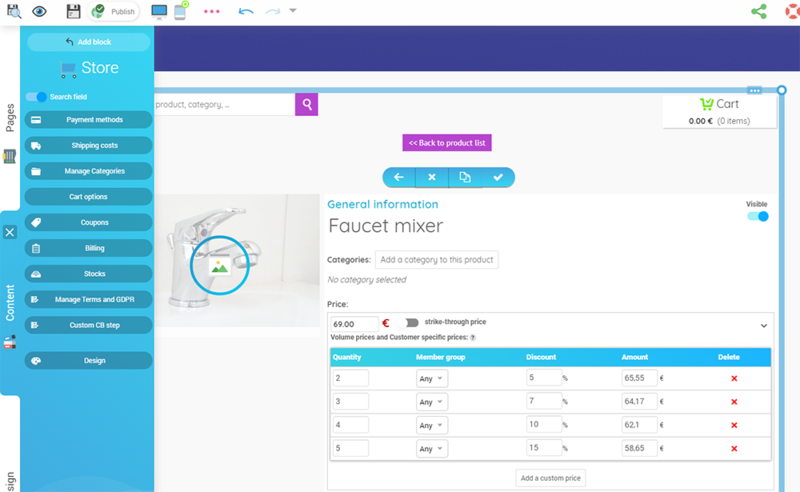 SiteW offers you the possibility to create specific prices for your online store products, according to various parameters: promotional campaigns, customer-based discounts, wholesale prices, additional costs depending on product options. You can thus create an accurate pricing policy, that perfectly fits your marketing strategy. Custom prices for your online store: How does it work? 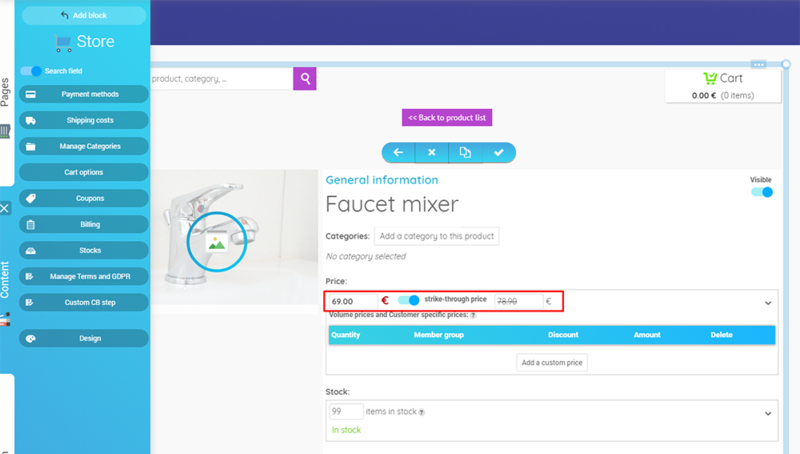 On SiteW stores, you can create different specific prices that apply on the base price of your products. You can display strikethrough prices, when you launch a promotional campaign for example. You also have the possibility to offer wholesale prices, or customer-based prices. These prices are set in percentage or in cash, and they replace the base price. Finally, you can create additional costs, according to the product options available. How to create additional costs for product options? If you want to offer your customers the possibility to choose among different sizes, dimensions, colors, etc. 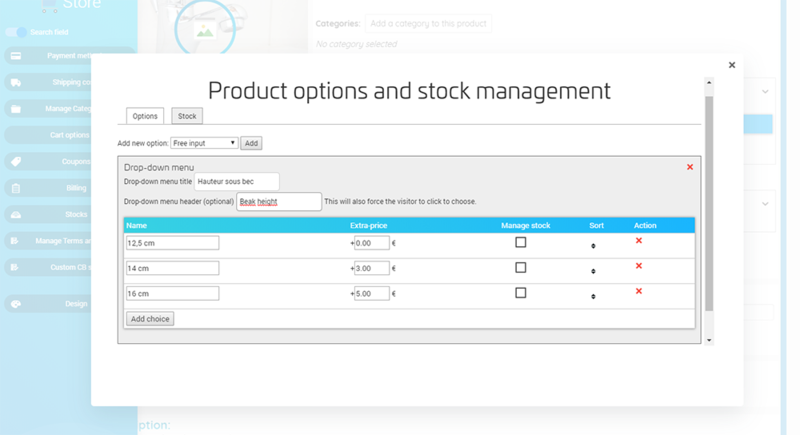 for a specific product, while adding related costs if needed, you can add product options. The settings apply to the base price of the product. The additional costs will remain unchanged, regardless of the quantity ordered, and whether the customer is a member or not. How to display strikethrough prices? On the website modification page, select your Store block. Click on the desired product to modify it. Check the option “Strikethrough price”. Enter your strikethrough price in the corresponding field. How to display wholesale prices? In the “Price” section, click on the arrow to see more options. Click on the button “Add a custom price”. Enter the desired quantity in the “Quantity” column. Leave “Any” in the “Member groups” column. Enter your discount in percentage or cash, in the appropriate column. You will be able to delete the custom price, by clicking on the red cross at the end of the line. NB: A table with wholesale prices will be displayed on the product description. How to create customer-based prices? Select the product to be modified. Click on the arrow to see more options in the “Price” section. Click on the button “Add custom prices”. In the “quantity” column, enter 1. Select your group in the dropdown list, under “Member groups”. NB : To enjoy the special prices, your members must be logged in (the discounted price will be displayed and applied to all products added to cart, after login). Feel free to use these customization features, to set your pricing policy according to your needs, and to your sales strategy.